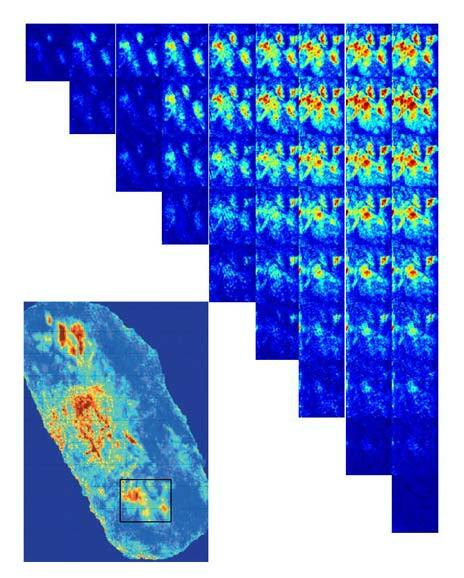 The Valhall permanent seismic array (Life of Field Seismic; LoFS) has successfully provided easy access to high quality 4D images for the purpose of improving oil recovery. Matrix image of 45 4D difference maps. First row: Difference between first monitor survey and base survey, second monitor survey and base survey etc. Second row: Difference between second monitor survey and first monitor survey, third monitor survey and first monitor survey etc. This figure demonstrates that ultra-frequent seismic monitoring gives opportunities to detect dynamic changes as production proceeds. Lower left figure shows 4D difference for the whole field, and black rectangle shows the subset used to create the matrix figure. © BP This article provides an overview of the key elements and basic deliverables of the Valhall LoFS project. A subsequent article will discuss the linkage between 4D seismic response and rock mechanics, and show some results from emerging technologies like full waveform inversion and use of passive recordings. The first version of a permanent seafloor seismic array was implemented at the Foinaven Active Reservoir Management (FARM) project in 1995 in the UK sector of the North Sea. In January 2000, BP rolled out the LoFS concept to seismic contractor and manufacturing companies, in order to engage them in the creation of a market for permanent seismic cable technology. A solution that included equipment from Oyo GeoSpace was selected. The Valhall field in Norway was then identified as a good candidate for trying out this type of technology. It was thought that the new system would be a major factor in improving the recovery and add significant value to the field. During the summer of 2003, 120 km of seismic cables were trenched into the seafloor covering an area of 45 km2 above the Valhall field. A total of 2400 receiver units, each with 4C sensors (3 geophones and one hydrophone) provide a live signal throughout each survey. The cables are connected to a recording system at the central platform. This system is controlled from the acquisition vessel, and data can be sent onshore via the optical network. No part of the subsea system is exposed above seafloor, thus avoiding any conflict with the fishing activity in the area. Between surveys, the receiver array may remain active, in order to detect any micro-seismic activity that may occur. In 2006 the array was extended with a permanent down-hole optical seismic sensor system. The sensors were installed between the tubing and the casing, at 2000 m depth in a water injector, as part of a field trial program. BP has later installed a trenched OBC system over the Clair field west of Shetlands and a semi-permanent OBC system with moveable cables over the Azeri-Chirag-Gunashli (ACG) field-complex in the Caspian Sea, Azerbaijan. The link between wells and 4D seismic response observed at Valhall is obvious. One of the most encouraging observations is that although the seismic image quality is so poor in the central area of the field that it is hard to map the reservoir based on static images, the time-lapse effects appear in the difference data and might help define the reservoir geometry © BP The Valhall LoFS program is designed to support the water injection program, to improve recovery rates by optimizing the placement of production wells, to reduce the cost of drilling new wells and to identify upside opportunities. The first dedicated water injection well was in place in 2006, and up to 100 new infill wells and water injectors are likely to be drilled over the field life to the 2040's. The low matrix permeability and the nature of the chalk reservoir raises considerable risks associated with its implementation, and early information on sweep efficiencies is critical to optimal implementation. The expectations at the start of the LoFS program were to observe effects of water injection as seismic amplitude and time-shift signals, at least in the areas where the seismic signal was good. The value of the LoFS will also be in optimal placement of new wells, i.e. to avoid drilling production wells into flooded areas. In addition, wellbore stability issues, associated with dynamic changes in the overburden, are likely to increase drilling costs. Frequent mapping of the 4D seismic response is expected to improve the understanding of these changes, and thereby reduce drilling costs. Converted wave images from 4C recordings are vital in imaging the central part of the reservoir, where a gas cloud disturbs the seismic signal. With the LoFS set-up, we expected to improve these images significantly. To date we have acquired 11 seismic surveys with an average of two surveys per year. This is slightly less ambitious than the initial plan of three surveys per year, which was linked to a more aggressive injection program. The data has been acquired with the same seismic source, initially using the standby vessel and later a supply vessel. This arrangement turned out to be safe, very cost effective and flexible. The supervision of the recording system has been done from shore, with no need to visit the platforms during the surveys. A rigorous but flexible QA system on the platform was designed to be available via internet. This provided the basis for the coordination of the operations between the office in Stavanger, the vessel and the service providers in Houston, Edinburgh and Oslo. The expectation of a rapid turnaround in processing data has been met, with a fast-track product being available within days of the "last shot". This scheme utilizes a combination of automated pre-processing on the platforms, the transfer of data via internet, and high end imaging algorithms at our High Performance Computing centre in Houston. The "state-of-the-art" 4D processing has been delivered by PGS geophysical. Effective workflows have been established to deal with the volume of data, to perform complex data analysis and to communicate the results to the end users and decision makers. In-house processing capabilities for generating the 4D products, a direct link to our seismic interpretation projects, and rigorous standardization have all been advantageous. The result is that all updated 4D products, including difference data volumes, time-lapse attribute maps and cross-sections along all wells are available within hours of new seismic data being produced. © BP Capturing the value of LoFS is organized around three key activities: Reservoir Management, New Wells Delivery and Base Management. The initial driver for the program is the field's depletion plan, which establishes a Reservoir Management Plan for long term. The forecast indicating expected delivery and the surveillance program are both used to identify possible upside opportunities and to recognize the need for mitigation actions if necessary. The LoFS program is an integrated part of this surveillance scheme. We have developed dedicated workflows for supporting the standard work processes in the sub-surface team. The major difference to a standard 4D seismic workflow for history matching and model update is the frequency of surveys. To generate synthetic seismic responses of one or more realizations of the model in the same time periods that a survey is available is a crucial activity. Synthetic attribute maps are available and can be matched with the observed seismic attribute maps on the workstations or via a web-browser. Alternatively, the data are subject to additional matching processes that provide guidance on which realization of the model provides the best data fit. 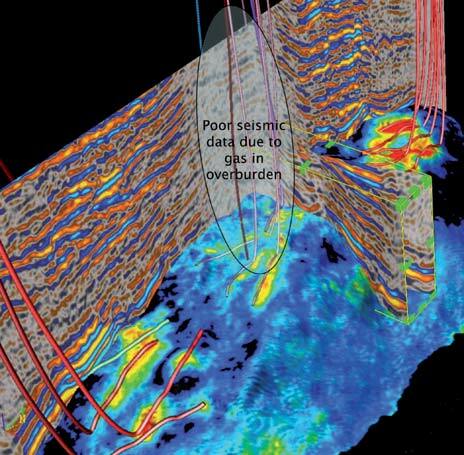 Capturing the value of a 4D seismic image is not contingent on a complete reservoir model validation process. The 4D images of the reservoir and the overburden response also provide a contextual framework for detailed analysis and helps to reduce the risk associated with drilling. This qualitative analysis is important in defining an optimal well trajectory, which might be challenged by localized stress changes in the overburden or pressure baffles within the reservoir. The third element for capturing the value is through Base Management, optimizing production and injection in existing wells. The strong correlations between the lateral variations in the 4D response and the in-well measurements has led us into transforming the 4D changes into contributions by the individual perforations. This has proved an efficient way of communicating the 4D response across the disciplines involved in managing and optimizing well production. The 4D images at Valhall reflect production induced changes at the detailed level of individual perforations. This not only provides an extremely useful tool for understanding the well performance, but adds to confidence in the relevance of the signal. Interestingly, the dynamic seismic time-lapse signal has a higher signal to noise level than static images. The 4D response is clearly visible at locations where the static image is poor due to gas in the overburden. This data has thus become an integrated part of the team's day-to-day activity, providing essential context for understanding the field performance and helping in selecting between possible scenarios. The importance of the LoFS seismic data for use in overburden characterization is far above our expectations. However, converted wave imaging remains challenging, probably due to difficulties in defining the P-wave velocities in the gas affected areas above the field. The Valhall LoFS program has been a technical success and delivered real business value in reducing drilling cost and increasing the resources. The key components of the success have been first class 4D images delivered over very short time intervals; new data provided in a timely manner and within budget; and better repeatability than that achieved by repeat marine streamer 4D. Tidal and seasonal water velocities and sea state appear to be the main source of non-repeatable energy. Strong collaboration with all service providers, a small but highly experienced team, a proactive partnership, full integration with the subsurface team, simplifications and standardization are all elements in the successful implementation of this technology. The long term plan is to acquire two surveys a year at Valhall. A possible extension of the seismic array has also been discussed. The top-side part of the system has now been replaced with higher capacity and newer equipment. The Valhall Life of Field Seismic program has been established as a critical element of the field surveillance scheme aiming at maximizing production. Improved recovery rates have been obtained by optimizing the location of both water injection and production wells, in addition to identifying new upside opportunities. The LoFS results are therefore seen as critical in delivering new wells, improving the flow simulations and optimizing production. The Valhall field was discovered in 1975 with well 2/8-6 following an exploration campaign struggling to solve the problem of the central gas cloud. The field is an initially over-pressured, under-saturated NW-SE trending anticlinal Upper Cretaceous chalk reservoir. The Valhall field was developed under primary depletion for the first 23 years of its history. The primary drive mechanism for the field is compaction supported by solution gas drive. During this time the pressure dropped sharply and the field is now producing below bubble point in most areas. Dedicated water flooding has been active since early 2006. The estimated recoverable reserves of the Valhall field at start of production in 1982 were 250 MMbo. Now, after twenty-six years of production, a total of 625 MMbo oil has been produced out of the original 2.74 Bbo in place. The oil production rate is currently around 60,000 bopd and the field is expected to be producing until 2050. We would like to thank BP Norge AS and the Valhall partners, Amerada Hess Norge, Total E&P Norge AS and A/S Norske Shell, for permission to use field specific information. Cooper, M., P. Westwater, E. Thorogood, P. Kristiansen, and P. Christie, 1999. Foinaven Active Reservoir Management: Towed streamer and buried sea-bed detectors in deep water for 4D seismic, Ann. Intl. Mtg., Soc. Expl. Geoph. Expdd. Absts., 69, SRC 4.3. Barkved, O.I., P. Heavey, R. Kjelstadli, T. Kleppan, and T. G. Kristiansen, 2003, "Valhall Field - Still on Plateau after 20 Years of Production", SPE 83957. The estimated recoverable reserves of the Valhall field at start of production in 1982 were 250 MMbo. Now, after twenty-six years of production, a total of 625 MMbo oil has been produced out of the original 2.74 Bbo in place. The oil production rate is currently around 60,000 bopd and the field is expected to be producing until 2050. Martin Landrø is a professor in Applied Geophysics at the Norwegian University of Science and Technology (NTNU), Department of Petroleum Engineering and Applied Geophysics,?Trondheim, Norway. Olav Inge Barkved is an Advisor in Geophysics with BP. In 2006 he received the NPF Norwegian Geophysical Award for his technical contributions and ability to identify and implement emerging technologies to support development of the Valhall field. Lasse Amundsen is Chief Scientist, Geophysics, at StatoilHydro. He is adjunct professor at the Norwegian University of Science and Technology (NTNU) and at the University of Houston, Texas. Flashbacks on the first discoveries of oil fields in the Middle East. What is known about the impact of seismic surveys on fish and fisheries?